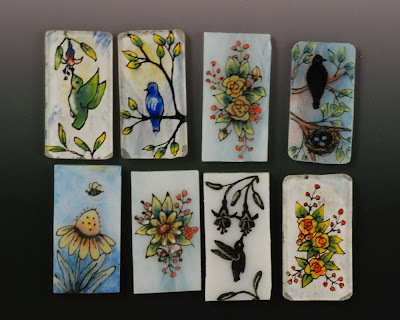 I have a stack of enamel-painted glass tiles stashed in a drawer for the day when I make new silver mountings for them. Yesterday I cut and formed the metal clay pieces for a new pendant, and today I did a lot of detailed sculptural details on the front -- nothing fancy, but vines, leaves and bezel cups for cabochons. Tonight as the kiln is clicking away, I'm pondering the options for the glass to mount inside. There are three types of enamel paintings here. One tile has just the black tracing. Several are reverse painted on clear glass with a coat of white on the back. The others are painted on the front with different enamels. The reverse paintings on clear are more vibrant, but they tend to react more with silver. Which to choose? This is the technique I'll be teaching October 14-15 in Pennsylvania. One full day will be playing with the various enamels on glass. And the second day will be constructing a setting for one of the glass tiles. There are still seats available. Holly Gage has more information. They are all so much fun! I truly wish I could come to your class - just too far for me to go since I am in California. Can't wait to see which one you choose to play with! Thanks, Cheryl! Maybe I'll get to head West someday.